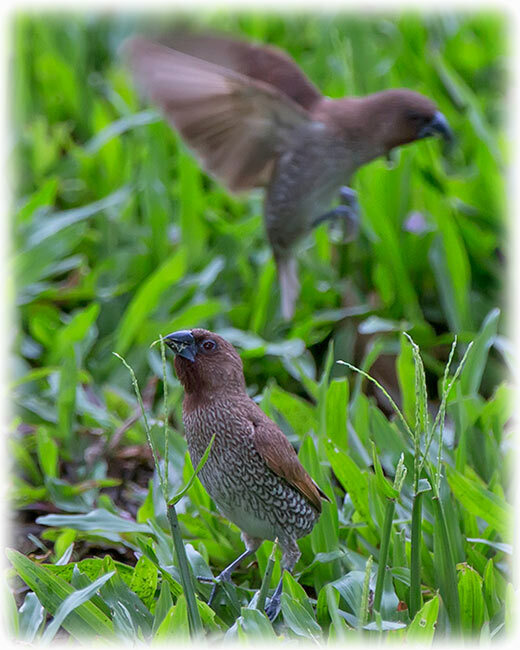 The Scaly-breasted Munia or spotted munia (Lonchura punctulata), known in the pet trade as nutmeg mannikin or spice finch, is a sparrow-sized estrildid finch native to tropical Asia. A species of the genus Lonchura, it was formally described and named by Carl Linnaeus in 1758. Its name is based on the distinct scale-like feather markings on the breast and belly. The adult is brown above and has a dark conical bill. The species has 11 subspecies across their range and differ slightly in size and colour. 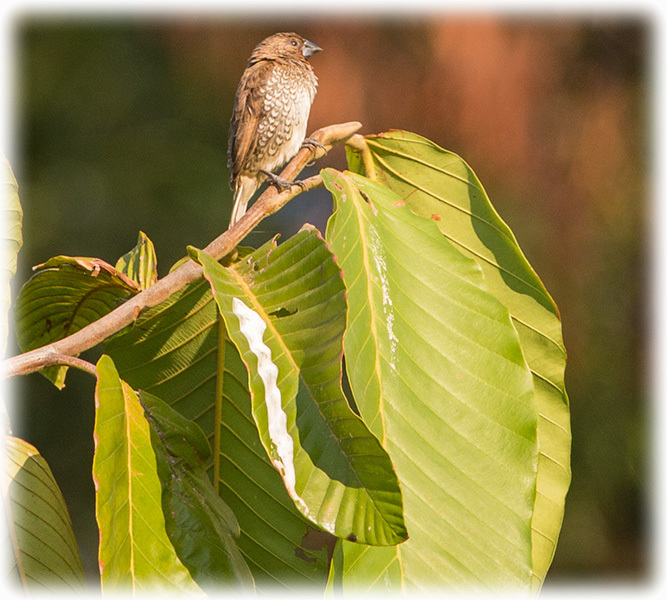 This munia eats mainly grass seeds apart from berries and small insects. They forage in flocks and communicate with soft calls and whistles. The species is highly social and may sometimes roost with other species of munias. This species is found in tropical plains and grasslands. Breeding pairs construct dome-shaped nests using grass or bamboo leaves. The species is endemic to Asia and occurs from India and Sri Lanka east to Indonesia and the Philippines (where it is called mayang pakíng). It has been introduced into many other parts of the world and feral populations have established in Puerto Rico and Hispaniola as well as parts of Australia and the United States of America. The bird is listed as of Least Concern by the International Union for Conservation of Nature (IUCN). Scaly-breasted munias are found in a range of habitats but are usually close to water and grassland. 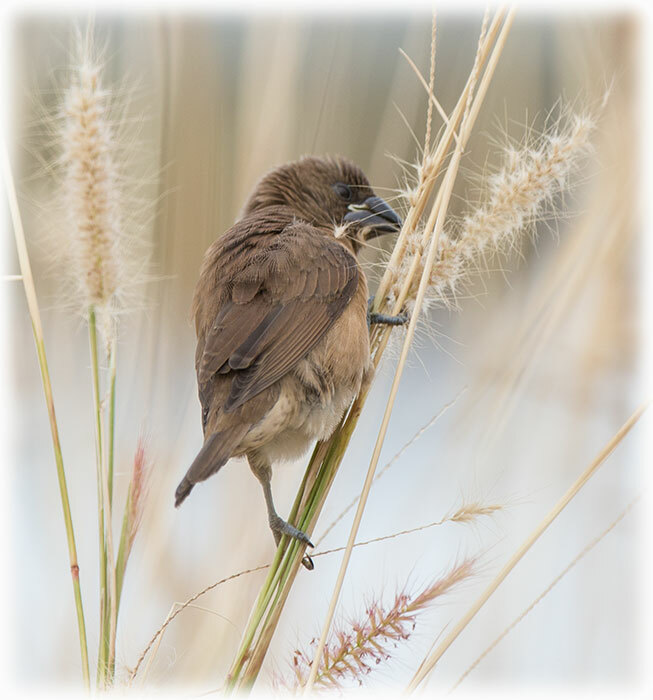 In India, they are especially common in paddy fields where they are considered a minor pest on account of their feeding on grain. They are found mainly on the plains, but can be observed in the foothills of the Himalayas, in which they may be present at altitudes near 2,500 m, and in the Nilgiris, where they are found at altitudes up to 2,100 m during the summer. In Pakistan, they are restricted to a narrow region from Swat in the west to Lahore, avoiding the desert zone, and then occurring again in India east of an area between Ludhiana and Mount Abu. The species has also been observed in Kashmir, though this is rare. Outside their native range, escaped birds frequently establish themselves in areas with a suitable climate and can then colonize new areas nearby. Escaped cage-birds established in the wild and such populations have been recorded in the West Indies (Puerto Rico since 1971), Hawaii (since 1883), Australia, Japan and southern United States mainly in Florida and California. 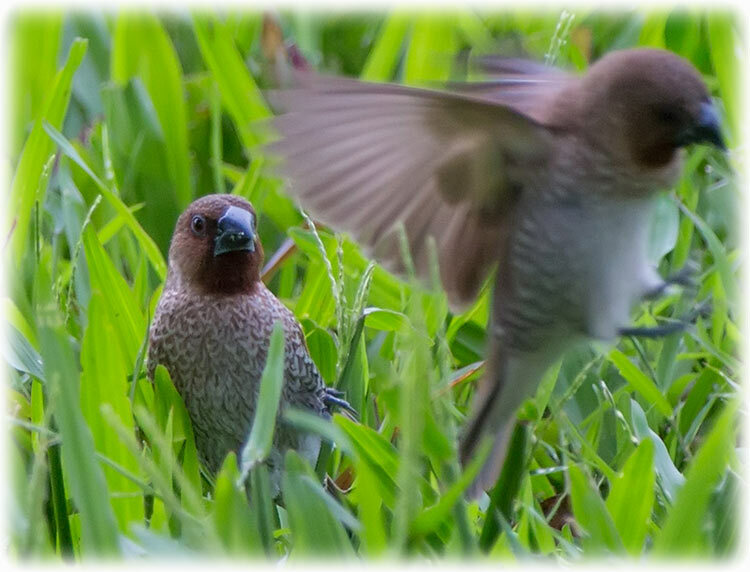 In Oahu, Hawaii, they compete for habitats with the tricolored munia and tend to be rare where this competitor is present. 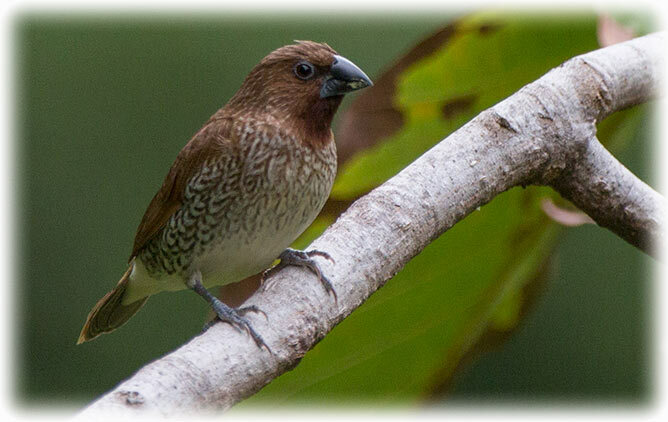 The scaly-breasted munia was one of the many bird species originally described by Carl Linnaeus in the 1758 10th edition of his Systema Naturae, where it was given the binomial name of Loxia punctulata. Sykes assigned it to the genus Lonchura in the combination Lonchura punctulata in 1823. 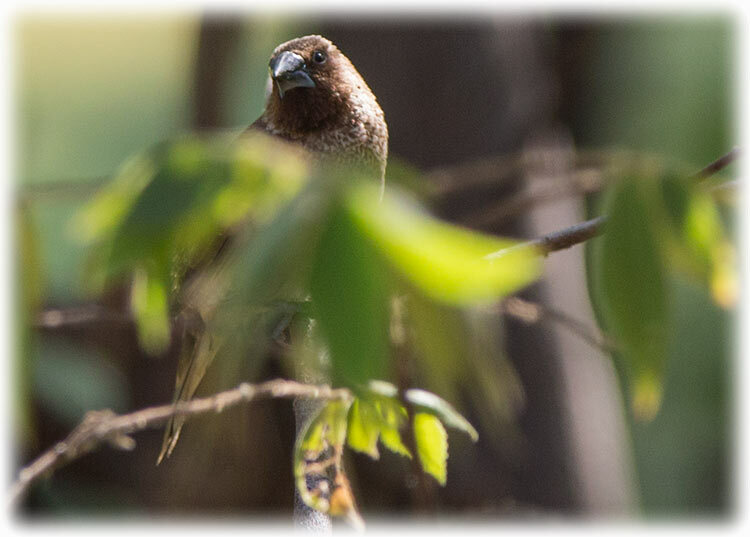 Over its range the scaly-breasted munia has been assigned to 11 generally accepted subspecies. These include the nominate form found in the plains of the Indian Subcontinent, including Pakistan, India, Nepal, Bangladesh and Sri Lanka. The name lineoventer was formerly used for the Indian population. 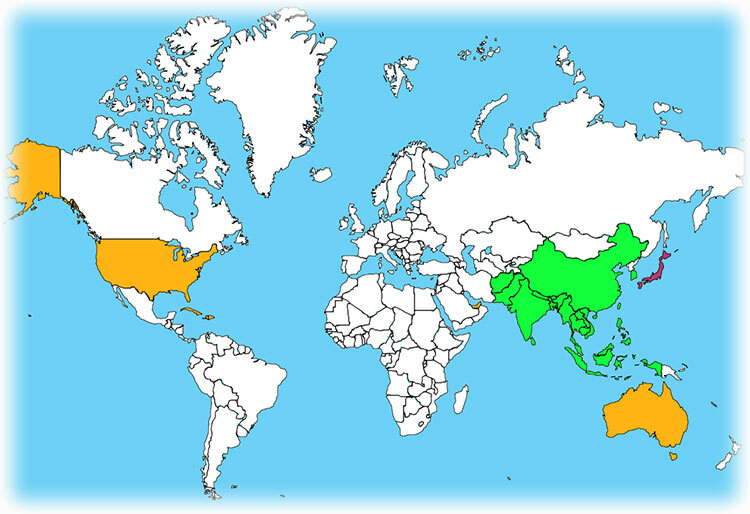 Other populations include subundulata from the eastern Himalayas, yunnanensis of southern China, topela of Thailand, cabanisi of the Philippines and fretensis of Singapore and Sumatra. 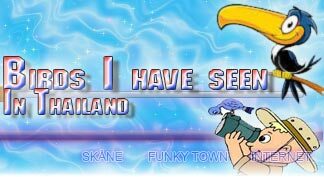 Island populations include nisoria (Java, Bali, Lombok, Sumbawa), particeps (Sulawesi), baweana (Bawean Island), sumbae (Sumba), blasii (Flores, Timor and Tanimbar) and holmesi (Southeast Borneo). • L. p. punctulata (Linnaeus, 1758) – Its range includes northern Pakistan, India (except northeast), Nepal terai and Sri Lanka. • L. p. subundulata (Godwin-Austen, 1874) – Its range includes Bhutan, Bangladesh, northeast India (Assam) and west Myanmar. • L. p. yunnanensis (Parkes, 1958) – Its range includes southern China (southeast Xizang, south Sichuan, Yunnan) and north – northeast Myanmar. • L. p. topela (Swinhoe, 1863) – Its range includes southern Myanmar, Thailand, southeast China (Taiwan), Hainan Islands, Laos, Cambodia and Vietnam. • L. p. cabanisi (Sharpe, 1890) – Its range includes Philippines (Luzon, Mindoro, Calauit, Palawan, Panay, Negros, Cebu, Mindanao) and northern Borneo (coastal west Sabah and Brunei). • L. p. fretensis (Kloss, 1931) – Its range includes south Malay Peninsula, Singapore, Sumatra and Nias Islands. L. p. nisoria (Temminck, 1830) – Its range includes southern Borneo (western & southern Kalimantan), Java, Bali, and western Lesser Sundas (Lombok, Sumbawa). • L. p. particeps (Riley, 1920) – Its range includes Sulawesi. • L. p. baweana (Hoogerwerf, 1963) – Its range includes Bawean Islands, off northeast Java. • L. p. sumbae (Mayr, 1944 ) – Its range includes Sumba, in western Lesser Sundas. • L. p. blasii (Stresemann, 1912) – Its range includes central & eastern Lesser Sundas (Flores East to Timor and Tanimbar Islands). 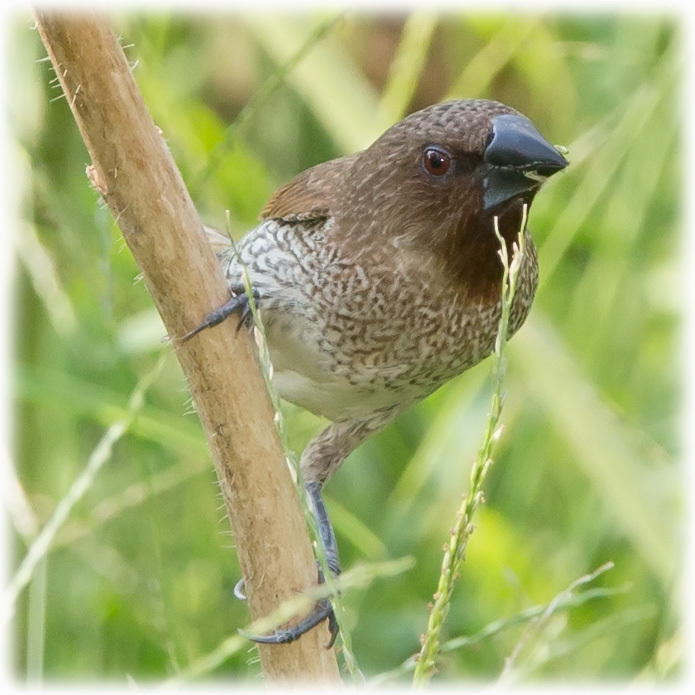 The scaly-breasted munia is about 11–12 centimetres long and weighs 12–16 grams. 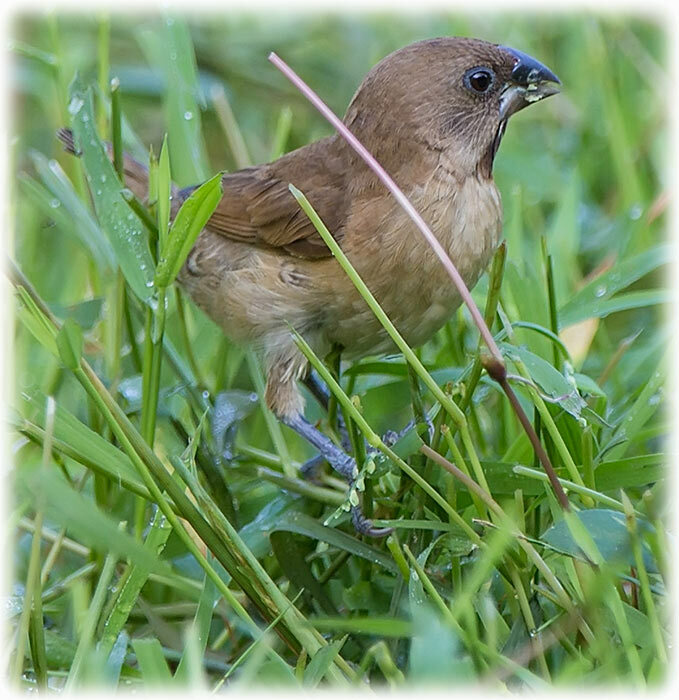 The adult has a stubby dark bill typical of grain eating birds, brown upperparts and a dark brown head. The underparts are white with dark scale markings. The sexes are similar, although males have darker markings on the underside and a darker throat than females. 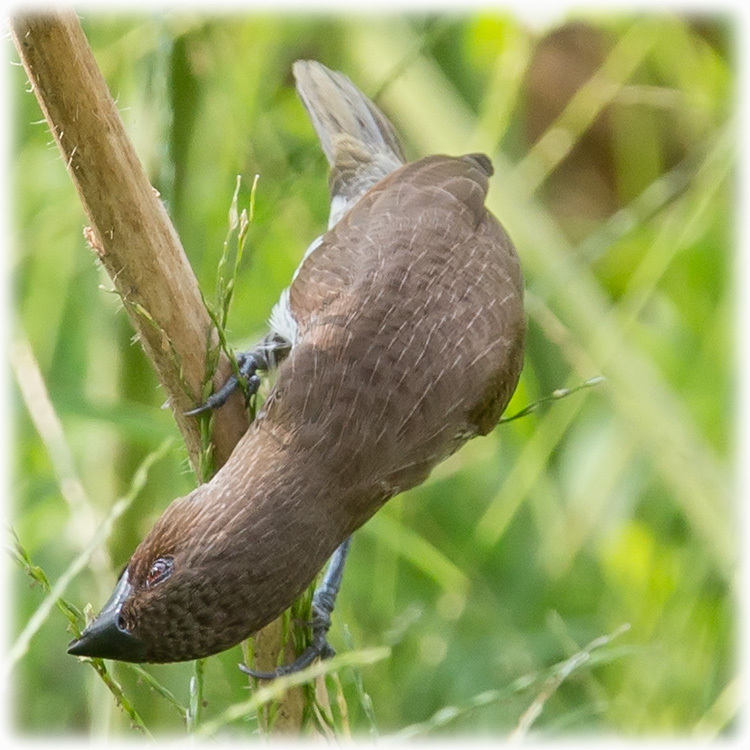 Immature birds have pale brown upperparts, lack the dark head found in adults, and have uniform buff underparts that can be confused with juveniles of other munia species such as the tricolored munia (Lonchura malacca) across the Asian and island populations and the black-throated munia (Lonchura kelaarti) in parts of India or Sri Lanka. Populations within their wide distribution range show variations in plumage color and size. Along with other Estrildines, these species are thought to have originated in Asia. The species has been introduced to other parts of the world due to its popularity as a cage bird and populations have established in the wild. Scaly-breasted munias form flocks of as many as 100 birds. Individuals communicate with calls that include a short whistle, variations of kitty-kitty-kitty, and a sharp chipping alarm note. They sometimes flick their tails and wings vertically or horizontally while hopping about. The tail flicking motion may have evolved from a locomotory intention movement. The exaggerated version of the tail flicking movement may have undergone ritualization. As a social signal, tail flicking in several other species acts as a signal indicating the intent to fly and helps keep flocks together. 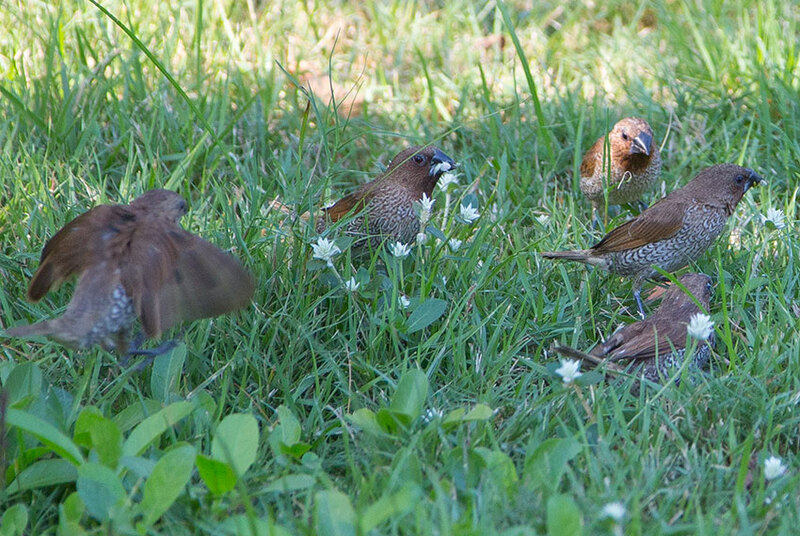 When roosting communally, scaly-breasted munia sit side-by-side in close contact with each other. The outermost bird often jostles towards the center. Birds in a flock sometimes preen each other, with the soliciting bird usually showing its chin. Allopreening is usually limited to the face and neck. 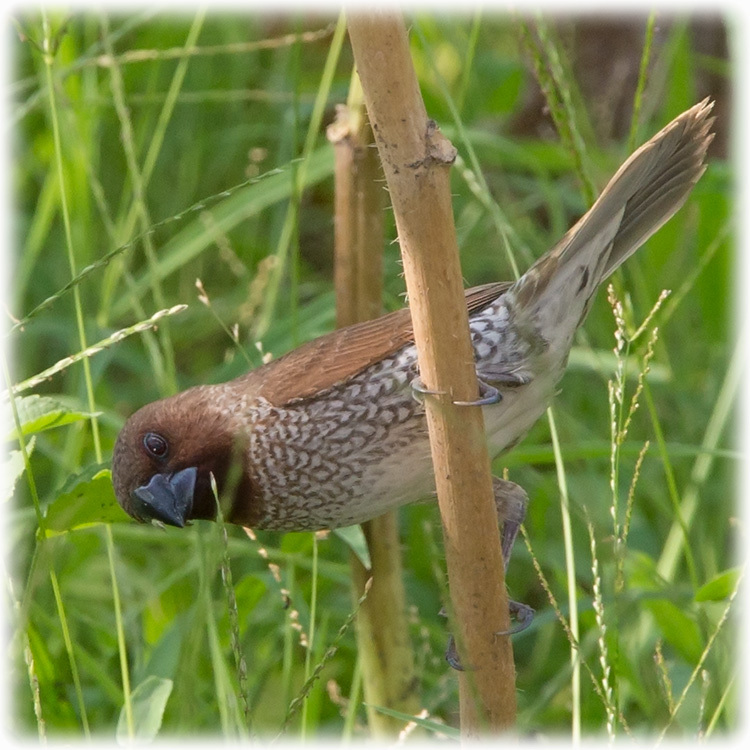 The scaly-breasted munia is rarely hostile but birds will sometimes quarrel without any ritualized posturing. The breeding season is during the summer rainy season (mainly June to August in India) but can vary. Laboratory studies have found that long day illumination and high humidity trigger gonadal growth. The song of the male is very soft but complex and variable, audible only at close range. This song described as a jingle consists of a series of high notes followed by a croaky rattle and ending in a slurred whistle. When singing the male sits in what is called the slope posture—erect with the head feathers raised. There are two types of slope posture, a pre-copulatory one and an ordinary one. 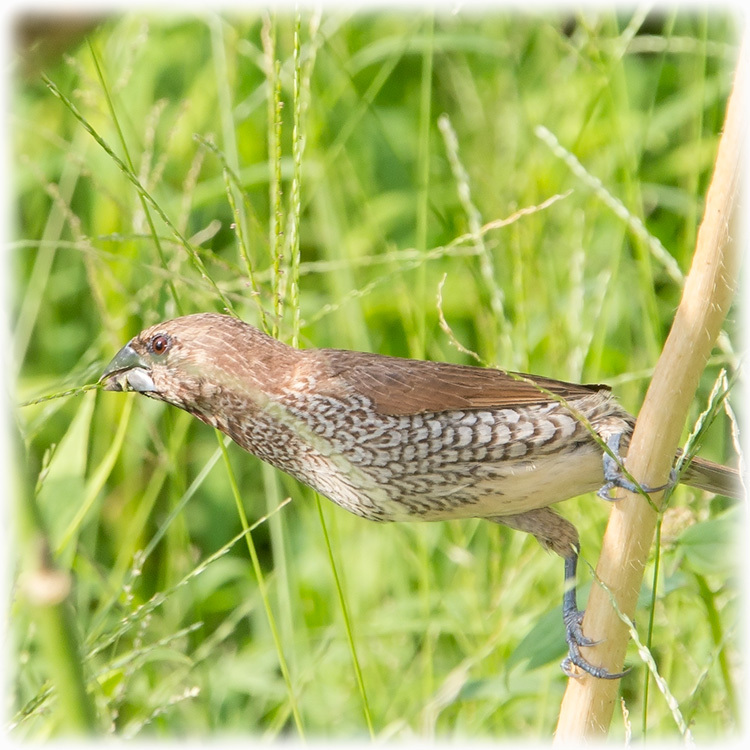 The pre-copulatory behavior of scaly-breasted munia includes a sequence of actions. The first involves either the male or female playing with nest-material. As soon as a bird has arranged the nest material in its bill, it begins to fly around in a zig-zag path. Once a bird lands close to its partner, the male bends towards the female and wipes its bill. The male then sings with movements of the body. The female invites mounting with tail quivering. The nest is a large domed structure loosely woven from blades of grass, bamboo or other leaves with a side entrance and is placed in a tree or under the eaves of a house. A study in southern India found the preferred nesting trees to be Toddalia asiatica, Gymnosporia montana and Acacia chundra, especially short and bushy ones in areas with low canopy cover. The nest opening is located to face downwind of the most frequent wind direction. In northern India, they preferred isolated Acacia nilotica in non-urban areas but used Thuja orientalis and Polyalthia longifolia in urban gardens. Scaly-breasted munia clutches usually contain 4 to 6 eggs, but can contain up to 10. 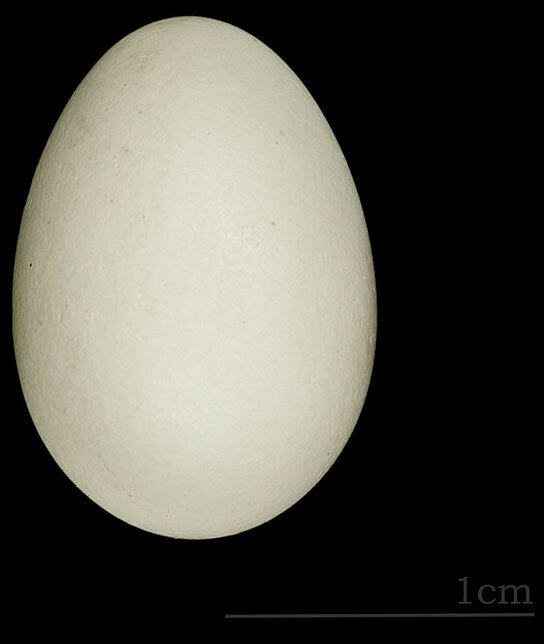 Both sexes build the nest and incubate the eggs, which hatch in 10 to 16 days. 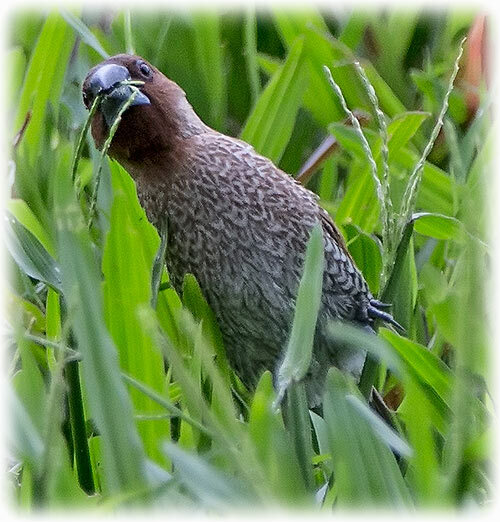 The scaly-breasted munia feeds mainly on seeds but also eats small berries such as those of Lantana. Although the bill is suited for crushing small grains, they do not show lateral movements of the lower mandible which help European greenfinches in dehusking seeds. Like some other munias, they may also feed on algae, a rich protein source, prior to the breeding season. verb [no OBJ.] (of a person or animal) search widely for food or provisions: gulls are equipped by nature to forage for food. • [with OBJ.] obtain (food or provisions): a girl foraging grass for oxen. • [with OBJ.] obtain food or provisions from (a place). • [with OBJ.] archaic supply (an animal or person) with food. 1 [MASS NOUN] bulky food such as grass or hay for horses and cattle; fodder. 2 [in SING.] a wide search over an area in order to obtain something, especially food or provisions: the nightly forage produces things which can be sold. The ease of maintaining these birds in captivity has made them popular for studying behavior and physiology. Feeding behavior can be predicted by the optimal foraging theory, where animals minimize time and energy spent to maximize food intake. This theory has been tested by studying the strategies used by scaly-breasted munias to increase their feeding efficacy. Studies on foraging have examined the effect of group size in reducing time spent on predator vigilance, thereby increasing feeding efficiency. According to the "many-eyes" hypothesis, a reduction in the individual time spent on vigilance against threats in larger groups allows for more time to be spent on searching for food and feeding. Vigilance is greatest among solitary individuals and reduces as the group size increases to about four. The birds collect seeds more quickly in larger groups, reflecting a decrease in individual vigilance, a decrease in handling time, and an increase in both search speed and focus when foraging. Individuals may also take advantage of group foraging by "joining" members that have found food. The options to seek food or to join others that have discovered food involves information sharing and has been studied through what are termed "producer-scrounger models". A cost associated with group foraging is increased resource competition, which in turn may reduce anti-predatory vigilance due to the intensity of foraging. Some studies show that increased competition results in a decreased feeding rate. 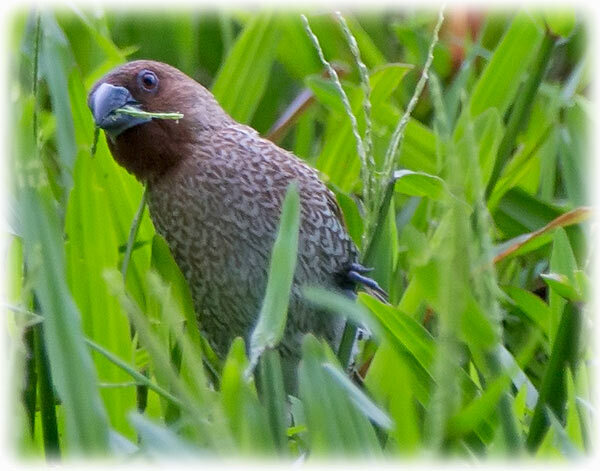 When foraging, scaly-breasted munia can search as individuals or search for others that have found food and join them. The economic consequences of the decision to join others has been modeled in two ways: the producer-scrounger model and the information sharing model. 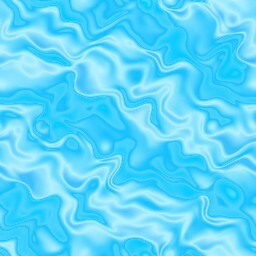 These models are based on hypotheses that differ in the degree of compatibility that is assumed between the two food and joining opportunity search modes. The information sharing model assumes that individuals search concurrently for finding and joining opportunities while the producer-scrounger model assumes that the search modes are mutually exclusive. Hopping with the head facing up and downward are observed to be statistically associated with the frequencies of a bird's joining and finding, respectively. When the expected stable frequency of the scrounger tactic was altered by changing the availability of seeds, the relative frequency of hopping with the head up changed accordingly. When the seed distribution made the scrounger tactic unprofitable, the frequency of hopping with the head up diminished and appears to support the predictions of the producer-scrounger model. Studies show that scaly-breasted munias tend to adopt the scrounger tactic when food is more clumped and when the group size increases. When most foragers adopt scrounging, the time taken to discover new food patches is greater. Most social foragers must search for food while also avoiding predators. It has been suggested that individuals that play scrounger could also, by virtue of their head position, be alert for predators and hence contribute to antipredatory vigilance. If the scrounger tactic is compatible with antipredatory vigilance, then an increase in antipredatory vigilance should lead to the detection of more joining opportunities, and hence more joining. When stationary, the head-up tactic has been shown to be associated with antipredatory vigilance. 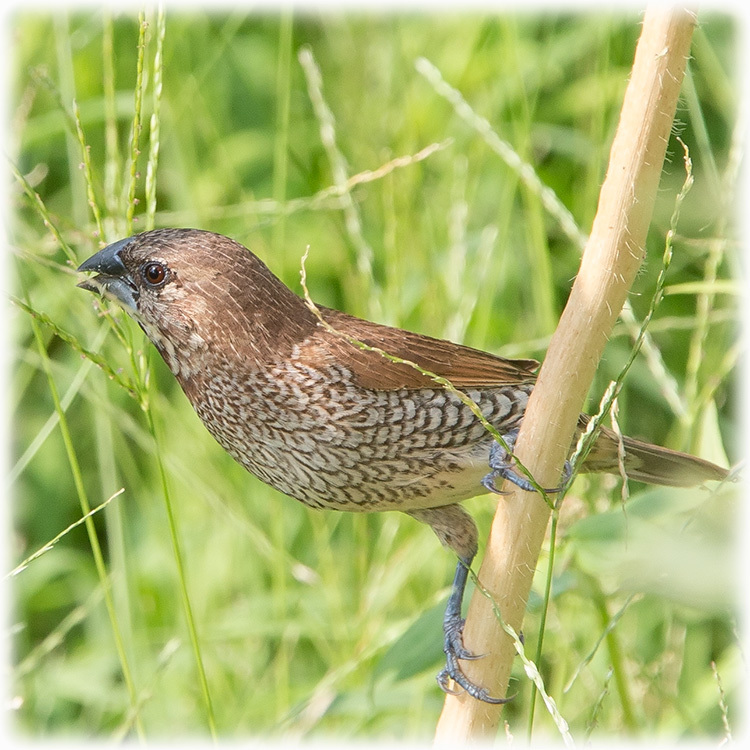 However scanning while hopping does not aid in vigilance and it is thought that the scrounger tactic is incompatible with antipredatory vigilance in the scaly-breasted munia. Scaly-breasted munias have variable competitive behaviors that allow them to exploit scarce resources. There are two foraging alternatives: producers that make the food available and scroungers that steal food found by the producers. Studies show that these choices lead to a stable equilibrium within a group. When individuals are free to choose between producer and scrounger, frequency dependent selection results in a stable mixture of both behaviors where each receives similar payoff. Studies indicate that if most of the population consists of producers, then scrounging behavior is favored by natural selection because there is plenty of food to steal. On the other hand, if most birds exhibit scrounging then the competition for stealing is so great that producing is favored. Three hypotheses might account for consistent foraging specializations across individuals: food source variation, phenotypic differences, and frequency dependent-choice. The food source variation hypothesis predicts that individuals will specialize when the use of two skills is more costly than specialist foraging. The phenotypic differences hypothesis proposes that individuals differ in their ability to use each foraging skill and stably specialize on the most profitable one. The pattern of specialization is expected to be stable although the number of individuals that use a given skill depends on the phenotypic composition of the flock. The frequency dependent choice hypothesis also proposes that individuals specialize on the most profitable skill, but the profitability of each alternative decreases as the number of phenotypically identical foragers gradually specialize on each skill when initially given two equally profitable alternatives. At equilibrium, individual payoffs should be independent of the pattern of specialization. Individuals in flocks adjusted their use of the two skills and two birds in each flock specialized on a different skill resulting in a variant of both the food source variation hypothesis and frequency dependent choice hypothesis. 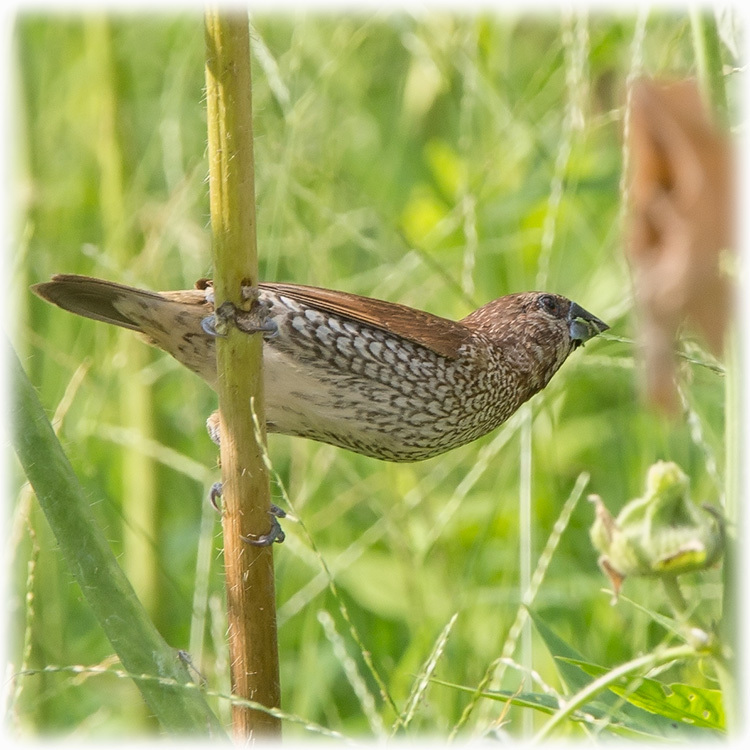 Aviary experiments conducted with captive flocks of scaly-breasted munia have tested whether producers and scroungers reach the predicted stable equilibrium frequency (see Evolutionarily stable strategy) when individuals are free to choose either behavior. The numbers choosing either producers and scrounger strategies have been shown to converge on stable frequencies while demonstrating that variation in tactics arise through frequency dependent pay-offs from the choice of different feeding strategies. 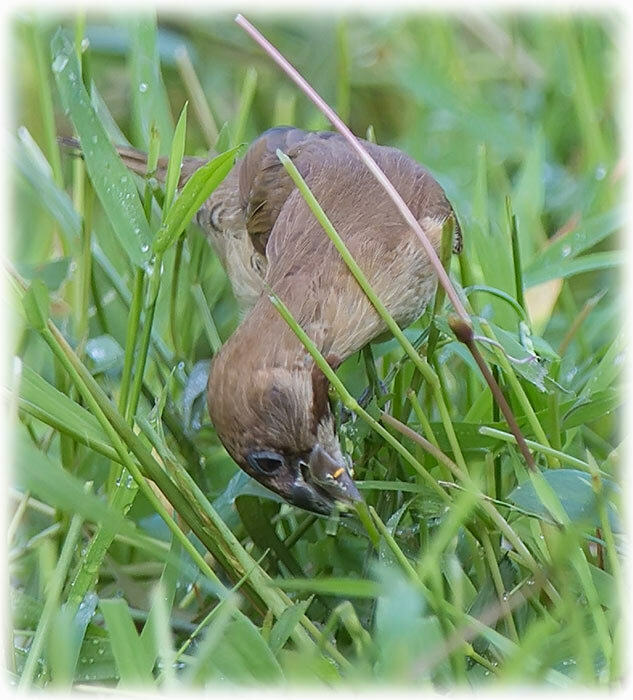 Furthermore, foraging birds may feed actively on the substrate or pick grains dropped on the ground and these strategies may be chosen according to the situation. Early departures occur more often when expected searching time decreases and when competition intensity increases. Competition intensity is expected to increase when more scroungers are present or when patches are smaller. Since producers search for food and scroungers wait for opportunities to join, prey crypsis imposes a producer specific cost that shifts the producer scrounger equilibria towards more scrounging. Prey crypsis resulted in increased latency to eat the seed and increased number of detection errors. Moreover, the presence of a competitor negatively affected foraging efficiency under cyptic backgrounds. The foraging efficiency of individuals that had previously foraged with a competitor on cryptic seeds remained low even after the competitor had been removed. Thus, the costs of foraging on cryptic prey may be greater for social foragers than for solitary foragers. Recent models of economic defence in a group-foraging context predict that the frequency of aggressive interactions should decline as resource density increases. 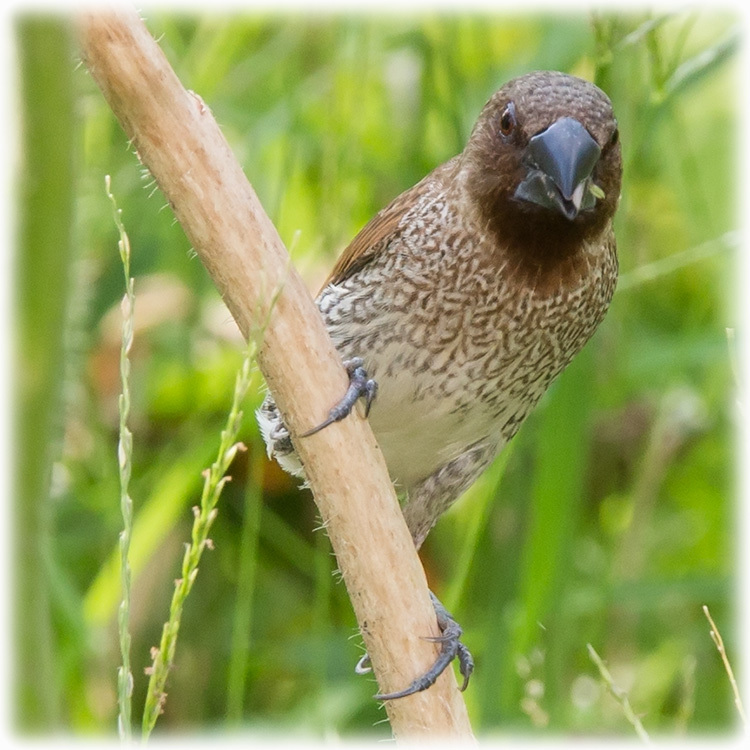 Studies with scaly-breasted munia show that the intensity of aggressive encounters was highest when patch location was signaled, and the effect of changing resource density depended on whether patch location was signaled or not. Signaling patch location was equivalent to making the resources more spatially predictable. Changing patch density had no effect on the number of aggressive encounters when the location of food was not signaled. When food location was signaled, increasing patch density resulted in the predicted decrease in the number of aggressive encounters. Lonchura punctulata is an abundant species and classified as "Least Concern" by the International Union for Conservation of Nature (IUCN). The species occupies an extremely large range, and its population, while still unquantified, is large and stable. 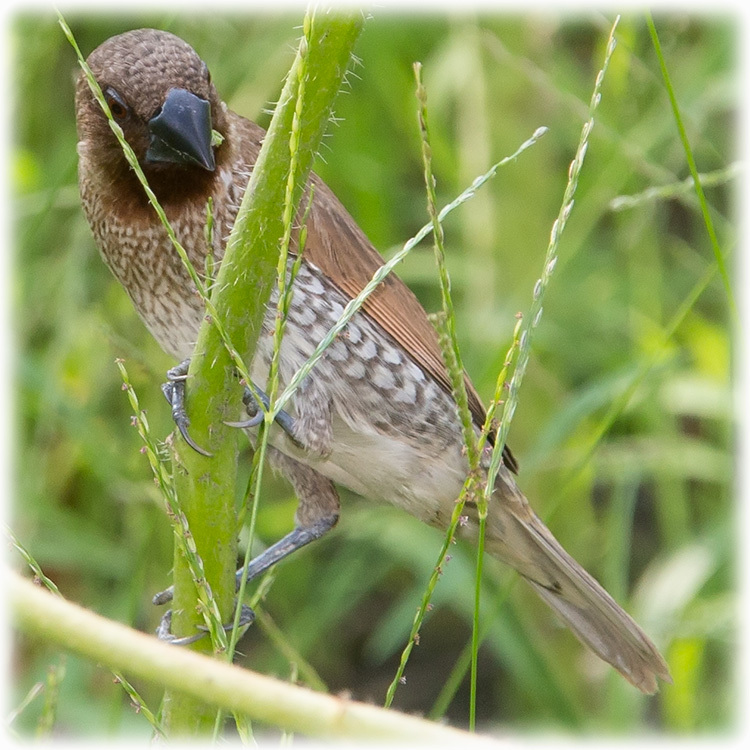 The scaly-breasted munia is not globally threatened and is common to very common throughout most of its range. However, some populations, such as those in the Lesser Sunda Islands are scarce. 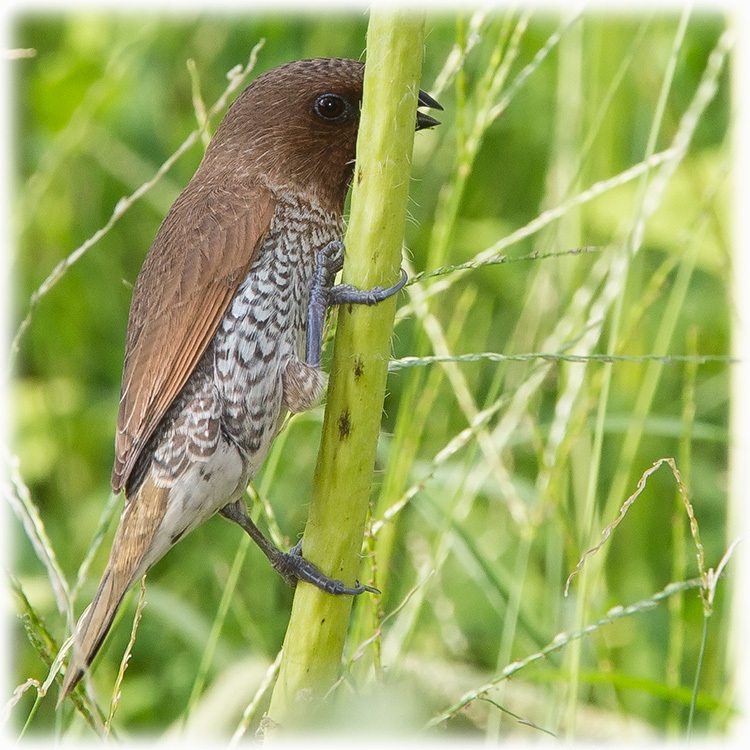 In many areas it is regarded as an agricultural pest, feeding in large flocks on cultivated cereals such as rice. In Southeast Asia, the scaly-breasted munia is trapped in large numbers for Buddhist ceremonies, but most birds are later released. Version 2013.2. International Union for Conservation of Nature. Retrieved 26 November 2013.